I just finished writing my Wattpad story, Call her Jagiya. I’m so conflicted right now. I don’t want this to be the last time that I see my characters, but I know that carrying on with the series will ruin the overall story and I don’t want that. The thing about writing is that I get really attached to my characters and letting go is not in my vocab. So I will be leaving this story, only coming back for the reread and rewrite a few more times. But I am proud of myself because I managed to finish this daunting story. I tried so hard to make it as good as the prequel and first book. I made my stories so that they can be able to stand on their own and be readable without any of the other stories. They all evolve around one character, Thanda, whom I love very much btw, on her journey to becoming happy again. It sounds pretty mundane, but to me that plotline is everything. I put my heart and soul into the story and I hope that when people get the chance to read it, they like it as much as I do. They can understand the protagonist’s struggle to be happy and to try to live a normal life. I guess we can say she is based on me. I’m sad about half of the time and I wanted a character that reflected me in that way. 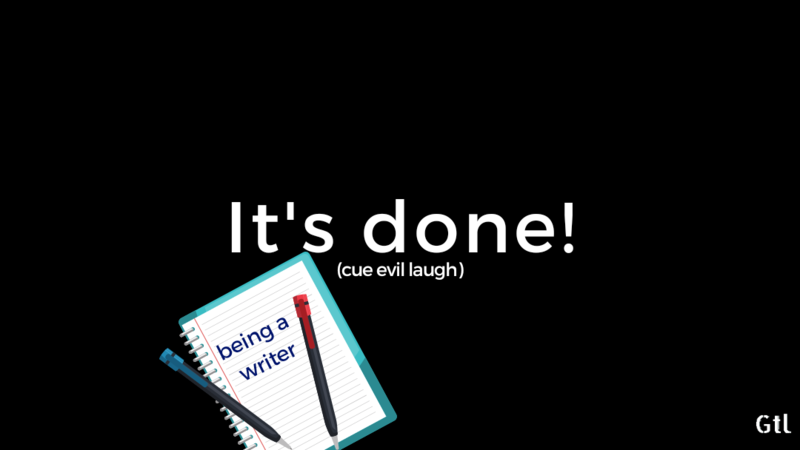 In writing a character who goes through a lot of what I go through (and worse, since I am evil) and end up happy in the end makes me believe that I too will someday end up happy and smiling as brightly as my characters at the end of the story. Any Q’s about story writing? Leave them in the ask section and I will answer as honestly as I can.